Year by year, week by week and game after game, the Lakeridge football team continues to prove that it belongs. The Pacers, now in head coach Elvis Akpla's fourth year, notched another milestone on Friday when they racked up a 42-point lead en route to their 54-33 win over McNary in the first round of the Class 6A state playoffs at Lakeridge High School. "We got things off on the right note," Akpla said. "The kids knew it was likely our last playoff game at home and they played well." Among the Pacers' other notable accomplishments this year are: Lakeridge won its first playoff game since 2014; the Pacers won their first home playoff game since 2013; the Pacers reached the playoffs for a second straight season; and Lakeridge went unbeaten at home this year, going 5-0 at LHS. With the win — No. 11 Lakeridge's fourth in its past five games — the Pacers improved to 7-3 overall after tying for third place in the Three Rivers League. Next up, Lakeridge will face sixth-ranked TRL foe West Linn (7-3 overall after tying the Pacers for third in the TRL) in the second round of the payoffs at West Linn High School at 7 p.m. Friday. In the two teams' regular-season contest, the Pacers dropped a 45-28 decision at West Linn on Sept. 21, though Lakeridge trailed by just one score until the final six minutes of the game. "The last time we played them, (West Linn senior running back) Dawson Jolley was out and (senior quarterback) Ethan Long hadn't practiced all week," Akpla said. "We've got to contain Jolley — he's an electric athlete — and we've got to contain Long — he's an unbelievable athlete." No. 22 McNary, meanwhile, finished its year at 4-6 after going unbeaten to win the Mountain Valley Conference. The Pacers hit the ground running on Friday, piling up a 20-7 lead in the first quarter, then adding a 22-0 edge in the second period to grab a commanding 42-7 lead at the half. Lakeridge junior running back Jalen John got things started with a 16-yard touchdown run, but after a rare missed extra point by Maxwell Chandler, McNary came back to take a 7-6 lead on a 1-yard Junior Walling run. But the Pacers owned the rest of the half, getting a 45-yard TD run by senior quarterback Charlie Maynes and a 61-yard Maynes scoring strike to junior Xander Houck to end the first quarter. In the second period, junior running back Caden Biege-Wetherbee kicked things off with a 14-yard touchdown run, John came through next on an 18-yard scoring run, and senior wide receiver Andre Martinez made it 42-7 when he hauled in a 20-yard TD pass from Maynes. 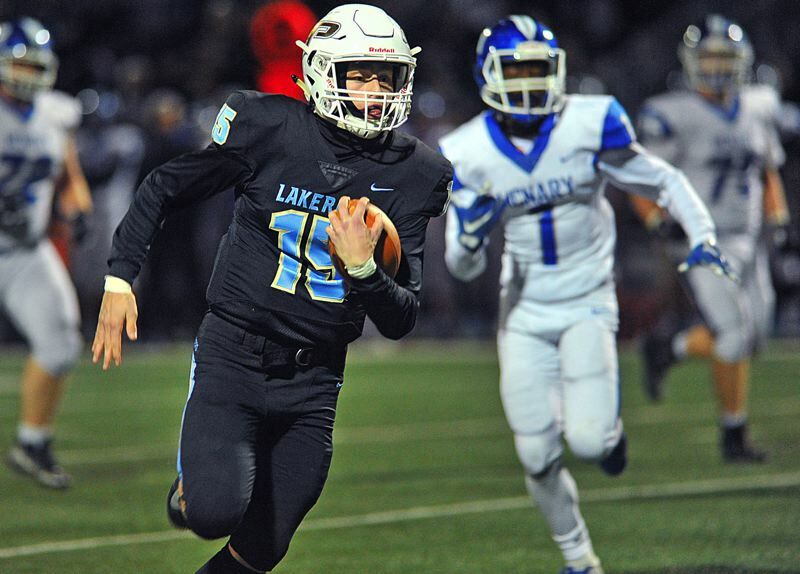 Lakeridge junior quarterback Cooper Justice made his presence felt in the second half with a 34-yard TD run in the third quarter that extended the Pacer lead to 49-7, and a 59-yard touchdown pass to junior wide receiver Carson Mike in the fourth. While McNary outscored Lakeridge 26-14 in the second half (including two TD passes from Ryan Bamford and one by Erik Barker), the Celtics never got within 20 points of the Pacers and Lakeridge cruised to victory. "The kids are learning how to win — every game we play makes us better," Akpla said. "We did a very good job against a very good McNary team that has been an Achilles heel for a lot of teams." For the game, Maynes went 7 of 12 passing for 187 yards and two TDs, Justice rushed seven times for 54 yards, John had eight carries for 53 yards, Martinez made four catches for 106 yards, Houck had two grabs for 67 yards and a score, and Mike made two catches for 65 yards and another score. On defense, senior Javier John made 10 tackles, and senior Finn Reeves and junior Ty Glumbik each finished with nine tackles. For McNary, Barker went 12 for 20 for 142 yards, one touchdown and one interception, Bamford was 7 of 10 passing for 86 yards and two scores, and Walling carried 19 times for 38 yards.